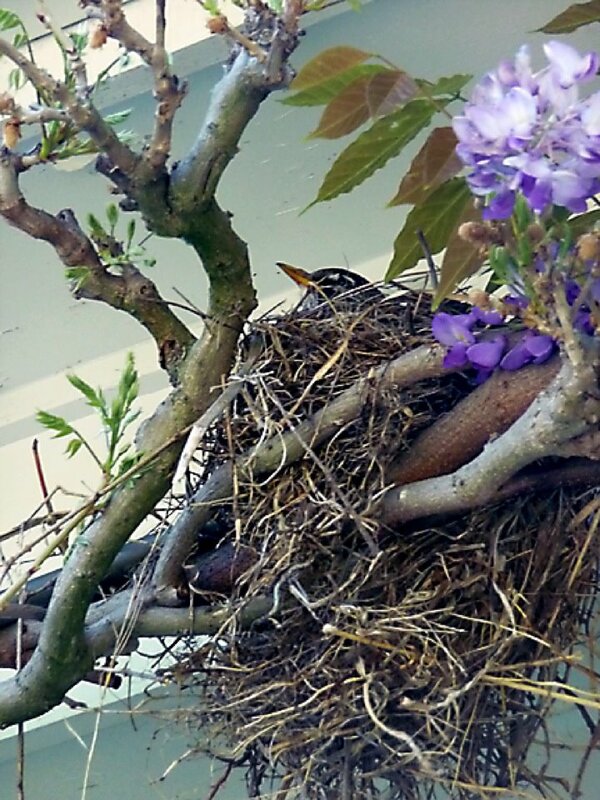 This entry was posted in Uncategorized and tagged bird's nest, robins, wisteria vine. Bookmark the permalink. I enjoyed your post about the uninvited guest. We had a wind storm recently that knocked down a Scotts Oriole’s nest. Thankfully, the baby had graduated flight school and the whole family was safe. When we looked in the nest, we got a wonderful surprise, it was lined in a deep blanket of fur from our dog, an Akita named Kuma. The day after the nest came down, we noticed the adults gathering Kuma’s hair after we had groomed her outside. How great it would be if we could learn how to accept challenges in such a matter-of-fact manner and simply start re-building! PS I’ve been dabbling in writing myself, if you get a chance, take a look at my website http://www.jtcarroll.com (my pen name is J.T. Carroll). I’ll send you a friend request if I can find you on facebook. How nice to hear from you! I will absolutely look at your website. I look forward to being your “friend,” again. Make sure they don’t get a whiff of the cats! My goodness, that makes me a great grandmother. Shouldn’t I have supplied some special baby equipment. Little rattles? Hope the kids do well and make you proud,. Such a sweet story, and love the pictures! Some birds nested in the back of our air conditioner a few years ago and my brother didn’t have the heart to evict them so he roasted for several weeks because he didn’t turn it on. Oh, one note: I once “rescued” a fledgling robin that was flopping around on the ground not quite ready to fly. Apparently this is normal when they first fledge and the parents were in residence to keep feeding it so I should have left it alone instead of taking it to a wildlife rescue center. So just keep the cats away on the days when the ‘lings first come out to explore the world. That’s so cool, Judy. From that nest you showed me, you now have baby birds. And what lovely wisteria! 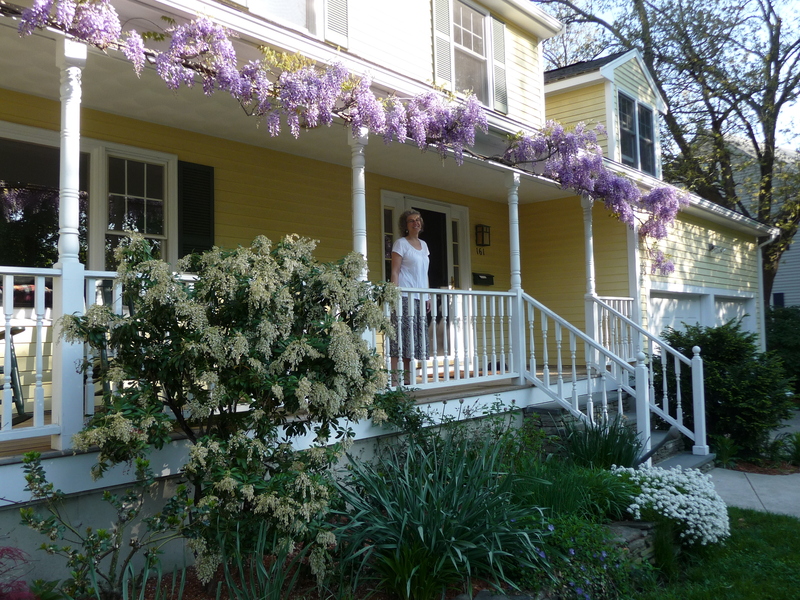 I want a bough of wisteria at my soon-to-be-new place. Awesome…you probably wouldn’t have seen them if the wisteria had bloomed! How much fun! You know, you can take the nest, once they’ve flown the coop – and hang it as a decoration. I think if you google it, you can find out if nests are typically re-used! Congrats—-grandma? No grandma – human mother!